With the prospects of limited trade relations between the United States and Cuba looming closer, the most important issue for Cuba is the future of its economy, which has been devastated by socialism, trade embargoes, and the cutoff of Russian welfare. Without question, once Cuba moves unequivocally towards a free market economy, financing institutions will be available to provide funding to promote economic growth in a new Cuba. Financing for projects through direct loans and other financial instruments will be available for improvement of water supply and sanitation, support and development of small business, modernization efforts, infrastructure repairs and maintenance, environmental clean-up efforts, from a plethora of public financial agencies, including the Inter-American Development Bank (IDB), the World Bank, the Canadian International Development Agency (CIDA), and others. As with Eastern Europe and Russia, it is for Cuba to take the painful reform steps necessary to put its economy back on track. However, as was the case in Eastern Europe, the largest and most important investments will come from the private sector. Most of these investments will be made for privatization of state-owned assets, and will come from private companies, with specific objectives, and from capital markets. On the one hand, unlike Eastern Europe, Cuba is less developed, and has experienced a lengthy economic crisis, which has taken a toll on both the physical and the human resources, making Cuba even a harder “sell” for private investors. On the other hand, Cuba’s close proximity to the United States, its underdeveloped and plentiful mineral resources, its educated work force, its top-rated natural attractions, as well as other characteristics, have a positive impact on potential foreign investors. 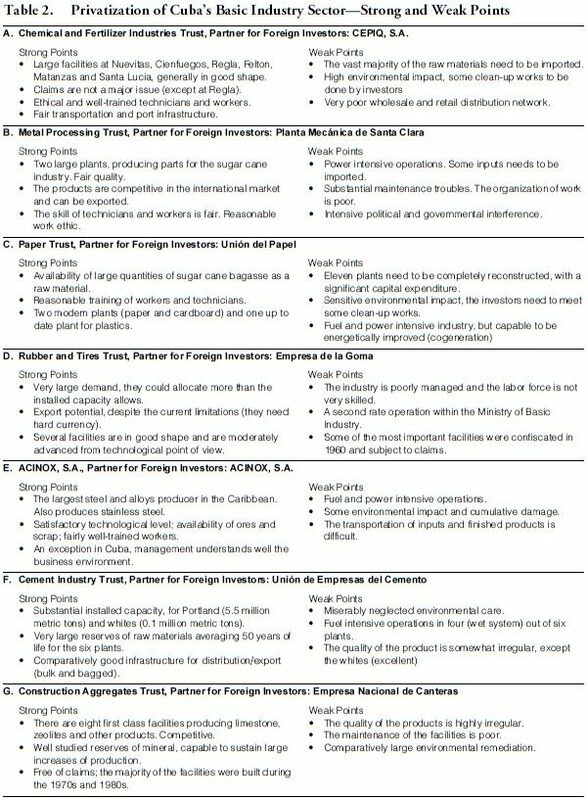 This paper summarizes the results of a mayor study conducted by Cuba-Caribbean Development Company, a corporation headquartered in Miami that provides international business services for companies and individual investors seeking to establish or expand business ventures in the Caribbean region, regarding state-owned enterprises in Cuba available to possible privatization. The paper is divided into two sections: the first section presents the results of the study with respect to potential privatization targets in the island. The second section discusses some ideas on a national privatization strategy in a post- Castro Cuba. Based on a variety of information sources—the Cuba data bank of the T. Babún Group, publications, interviews with experts in the business community, government and academia, information provided by scholars, and consultations with officials in the U.S. 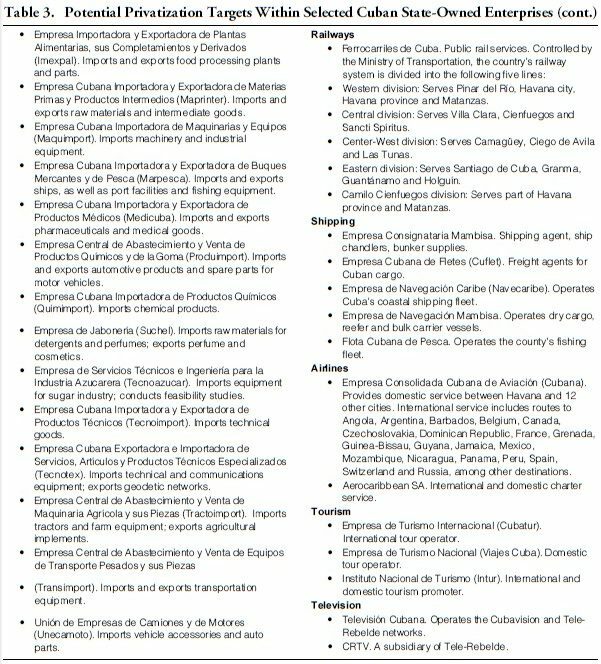 Departments of State and Defense—the study identified state-owned resources in Cuba available for possible privatization. The authors analyzed the pricing strategy employed by Poland, Czechoslovakia, Hungary and East Germany, in the privatization of many of their state-owned enterprises, and then applied similar ratios to Cuba’s assets. We further evaluated the potential for privatization in infrastructure concessions to construct and operate toll roads and ports, as well as in contracting-out and other private involvement in water and sewage systems, refuse collection and waste management, etc. 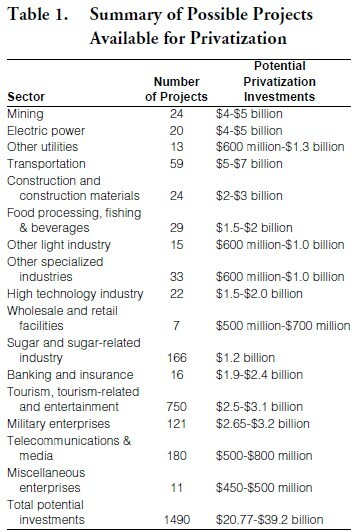 We believe that the total value of about 1,500 state owned target projects, when transferred to the private sector, will be between $21 to $39 billion (see Table 1). This amount does not include potential private assistance and loans, grants and grant guarantees from international financial institutions, multilateral organizations, and individual countries. For instance, in January 1997, President Bill Clinton predicted that Cuba could receive from $4 billion to $8 billion from these sources. 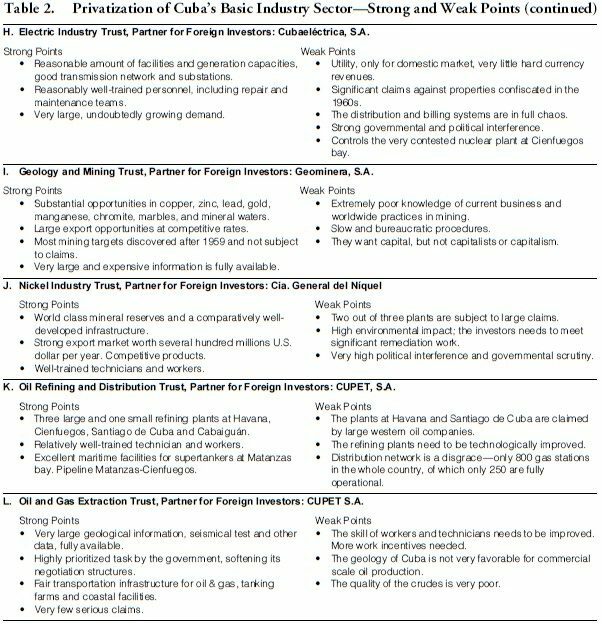 Table 2 reports on the strong and weak points of potential privatization targets within Cuba’s basic industry sector. This sector is composed of enterprises within the Ministry of Basic Industries (Geology and Mining Trust; Electric Industry Trust; Rubber and Tires Trust; Nickel Industry Trust; Oil and Gas Extraction Trust; Oil Refining and Distribution Trust; Plastic and Paper Trust; and Chemical and Fertilizer Industries Trust); the Ministry of Steel and Mechanic Industries (ACINOX, S.A., and Metal Processing Trust); and the Ministry of Construction Materials (Construction Aggregates Trust and Cement Trust). Table 3 identifies specific privatization targets within these larger groups of enterprises (trusts). Cuba can not afford the luxury of a lengthy and protracted privatization process. Once a national privatization program is introduced, it will be very important that it remain as consistent as possible. Perhaps, a new Cuba could first conduct the privatization of small-scale businesses, followed by high export-potential enterprises (and projects), while the government creates the optimum conditions for a full national privatization strategy. 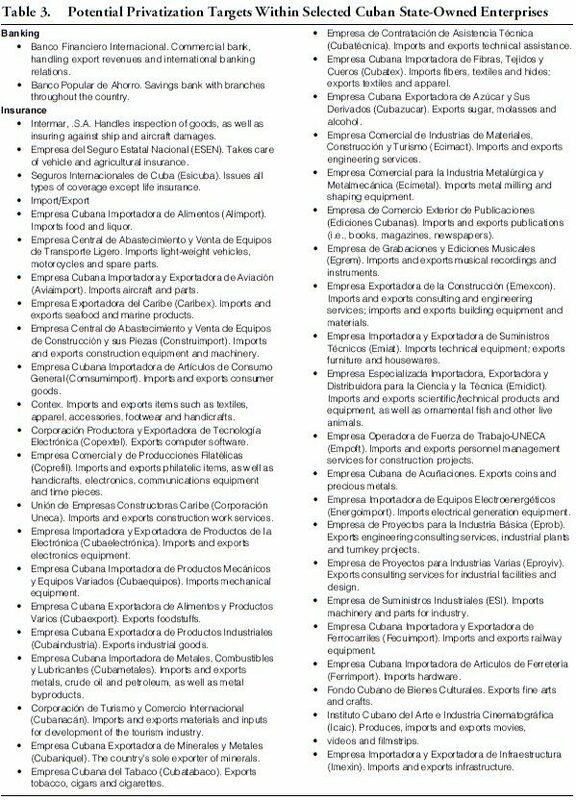 Cuba is well ahead of the former Soviet Bloc countries in preparing a base for privatizing its state owned enterprises. For instance, on August 24, 1998, the government approved a new law to decentralize 95 firms from the control of the Basic Industry Ministry. The companies planned to be spun off employ over 115,000 workers. But privatization of Cuba’s existing state-owned enterprises will not be an easy task. Cuba’s factories are large, cumbersome and inefficient. In fact, 88 percent of Cuba’s industrial plants are considered “large” by World Bank standards. The study identifies 170 state-owned enterprises (not sugar mills), with 500 or more workers, built or enlarged after 1959, as compared to only 14 plants (not sugar mills), with 500 or more workers existing in 1959. In addition, before large volumes of foreign capital and aid assistance would flow to the island, a new Cuba will need to deal with issues such as a large external debt, and a plethora of individual claims for confiscated properties. An analysis of these and many other critical pre-privatization issues are given in the next section of the study. The following ideas and proven concepts merit serious consideration in designing a national privatization program of state-owned assets. Economic stabilization, law and order, food, medicines, the establishment of workable institutions for policy implementation and establishment of property rights are critical to Cuba’s reconstruction and without doubt need to be addressed early on. Based on the widely differing experiences of Czechoslovakia, Hungary, Poland, East Germany and Russia, whatever process is followed must provide an unequivocal adjudication of property rights so that no legal obstacles to the privatization of enterprises are interposed by the existence of unresolved property claims against them. Therefore, while there is general agreement on the need to privatize state-owned enterprises and attract foreign investment to Cuba as rapidly as possible, there must first be a determination regarding the issue of property rights. Moreover, unless clear and transparent “rules of the game” are established and implemented, the amount and quality of investment taking place will be less than what is needed to put Cuba on a sustainable and high growth rate. For these, and many other reasons, the most relevant example for Cuba is East Germany, where its Treuhand Agency (Treuhandanstalt) was able to resolve most of the problems dealing with property claims, clear title and pricing. Some groups take the position that claims against the Cuban state should not be limited to property claims, but should include all manner of torts — addressing involuntary or uncompensated work, unjust imprisonment, loss of life or limb, loss of loved ones, physical or psychological abuse and harassment by agents of the state, discontinuance of pension payments, etc.—whose aggregate value defies imagination. Indeed, we doubt there is any legal or moral basis for assigning priority to settling claims against physical property over those claiming civil damages such as those suggested above. Moreover, precedents of various forms of compensation in ex-Socialist states such as East Germany, Czechoslovakia, Romania, and Hungary notwithstanding, the magnitude of the disaster in Cuba and the requirements to set the country back on track socially, politically and economically leads one to conclude that attempting to set up a process of claims adjudication in Cuba, at least during what will no doubt be an extremely difficult transition period, would be pure folly. One essential question to be answered is whether attempting to arrange some form of non-cash compensation for property and tort claims will be more conductive to reconciliation than adopting a nocompensation policy. For example, in Romania it was felt that, like many of its citizens, the country was suffering from post-traumatic stress syndrome, for which it had to undergo a difficult process of critical self-examination, healing, and reconstruction. Under a victim compensation law, more than 100,000 Romanians claimed compensation which, aside from cash, was granted in the form of benefits such as free public transportation and preservation of job seniority. The U.S. Foreign Claims Settlement Commission (FCSC) was created as an independent U.S. federal agency with the directive to determine and render final decisions concerning the claims of U.S. nationals for loss of property in certain foreign countries. In response to the Cuban Government’s nationalization and expropriation of billions of dollars in property belonging to U.S. nationals, the FCSC was given the authority to negotiate and settle Cuban claims. Under the International Claims Act of May 31, 1967, a deadline was established for filing Cuban claims, after which, all potential claimants were barred from presenting their claims. Over 8,000 Cuban claims were filed, and 5,911 were allowed for a total of approximately $1.8 billion in claims. Among the largest claimants are the Cuban Electric Co. ($267.6 million), ITT ($130.7 million), and North American Sugar Industries ($109 million). Among the smallest corporate claimants are Sears, Roebuck ($3.7 million), Pepsico ($1.9 million), and General Dynamics ($1 million). The FCSC has concluded that, in accordance with principles of international law, interest on approved claims should be computed at six percent from the date of loss to the date of settlement. This seems equitable given that most funds and credit balances belonging to the Cuban government which were blocked by the U.S. under the Cuban Assets Control Regulations, are held in interest-bearing accounts. The Cuban Government continues to maintain a strong position against the payment and settlement of such claims. Accordingly, the U.S. Government declared and implemented the Cuban Embargo. There is little doubt that a prerequisite for the lifting of the total embargo and the full normalization of relations between Cuba and the United States will be, among other matters, the eventual settlement of the Cuban claims. • Property rights were protected against confiscation by the Cuban Constitution of 1940; they should therefore be returned. • Since the government of Cuba does not have (and will not soon have) the means to compensate promptly, adequately and fairly, restitution is the best (only) workable alternative. • Restitution is the best way to implement rapid privatization and encourage recapitalization of the economy. • In the case of corporate claims, former owners have the managerial talent necessary for rapid development of the enterprise. • Other formerly socialist countries (Eastern Europe, Nicaragua) have implemented restitution policies. Accepting the possibility of restitution in resolving claims also means accepting legal encumbrance on property. Lawyers representing claimants are being disingenuous in arguing that restitution could be accomplished quickly. Ruling out restitution simply means that any litigation would be limited to challenges concerning the validity and quantification of the value of losses, and the compensation, if any. By ruling out restitution, a future government of Cuba could proceed immediately to privatize all small and medium-size businesses, and take steps to improve their financial footing prior to a full privatization program.